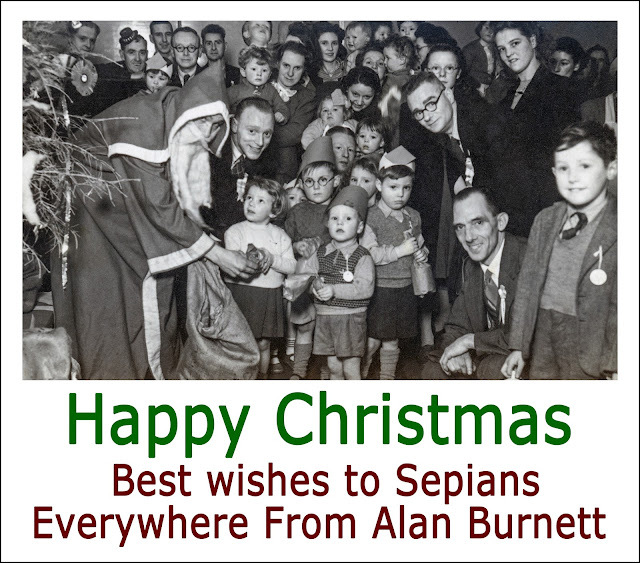 The basis of my Sepia Saturday Christmas Card this year is a picture that must have been taken at some kind of institutional Christmas Party. Searching the faces for someone familiar, I eventually found my mother holding my brother in her arms. 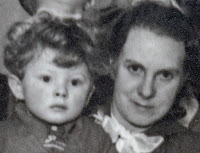 That led me to an estimation of the date, which must have been around 1945/46 when Roger was either two and a half or three and a half. I suspect it will have been a works Christmas Party and that would take me to the Bradford commercial printers and packaging engineers, Field Packaging, where my father worked at the time. 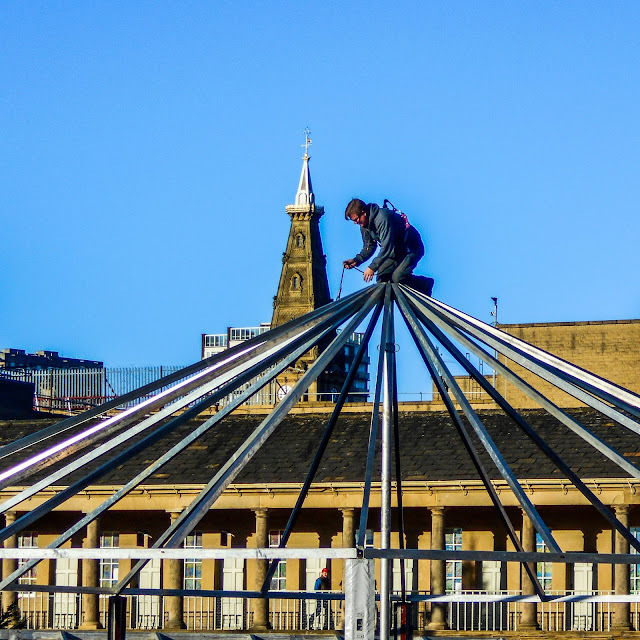 There is a festive dip into the pond of inconsequence today with a photograph I took last week of a spiegeltent being erected within the confines of Halifax's magnificent eighteenth century Piece Hall. A spiegeltent is a type of large travelling tent which originated in the Netherlands and is constructed of wood, canvas, mirrors and stained glass (not to mention - on the more modern ones - a few steel girders!). The one in Halifax will remain within the Piece Hall for the Christmas season and will be used as a venue for a variety of concerts and events (the famous Unthanks Sisters will sing there, the House of Burlesque will dance there and there is even a somewhat intriguing Silent Disco advertised). A performance to match any of these was the construction of the spiegeltent itself, and the circus-like skills of the construction crew. 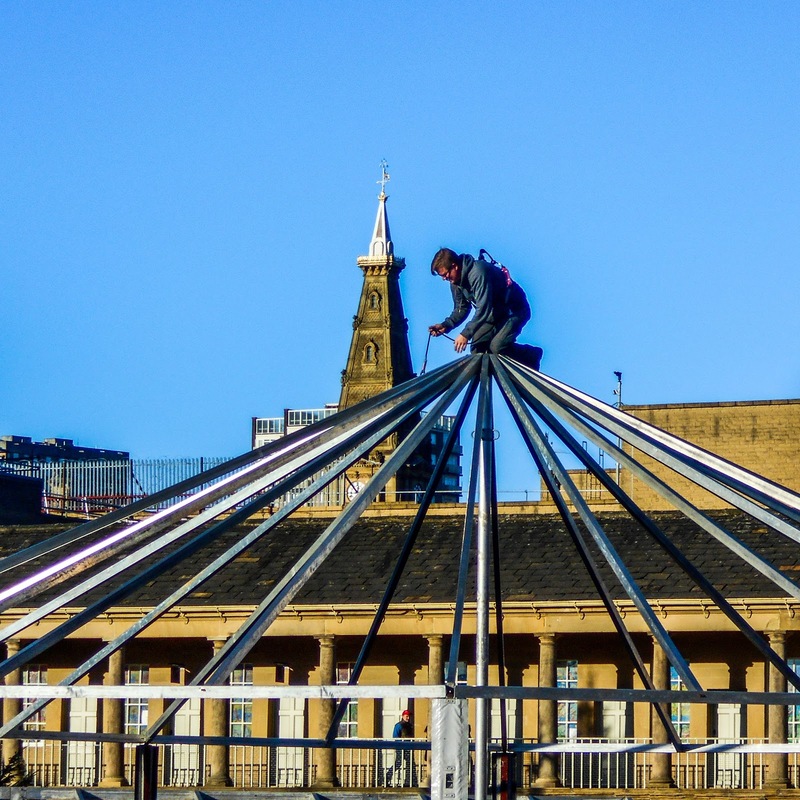 And the visual merging of the Georgian Piece Hall, the Victorian Town Hall, the sixties concrete and the continental style of the mirrored tent makes a fitting image to end a year that has been seeped in introspection and isolationism. Today, my dip into the seasonally induced pond of inconsequence brings up a rather splendid Edwardian postcard, entitled "A Reluctant Parting" by the artist and illustrator, Harold Cecil Earnshaw (1886-1937). 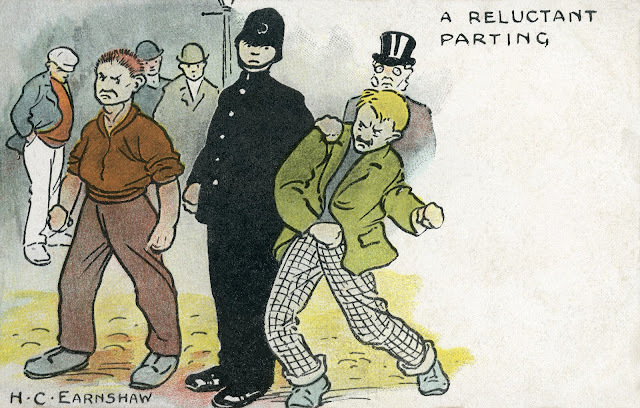 It was a rather grubby and creased affair that benefited from a scan and a digital clean-up, which allows you to appreciate a rather fine drawing that dates from the very height of the postcard craze of the first decade of the twentieth century. This was a time when postcards were the equivalent of Facebook updates and would be exchanged with great frequency and for the most prosaic of reasons. Earnshaw was an interesting chap who throughout his life worked as a cartoonist and book illustrator and was married to the far more famous illustrator, Mabel Lucie Attwell. During active service in the First World War, Earnshaw lost his right arm and had to set about learning to draw again using his left hand. This he did with great success and within two years of his injury he was once again working as an illustrator. 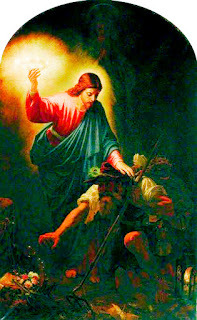 In the lead up to Christmas I am indulging myself with pointless blogposts about matters of no consequence. Today I am fishing in the pond of inconsequence whilst wearing my sepia Christmas bobble-hat. 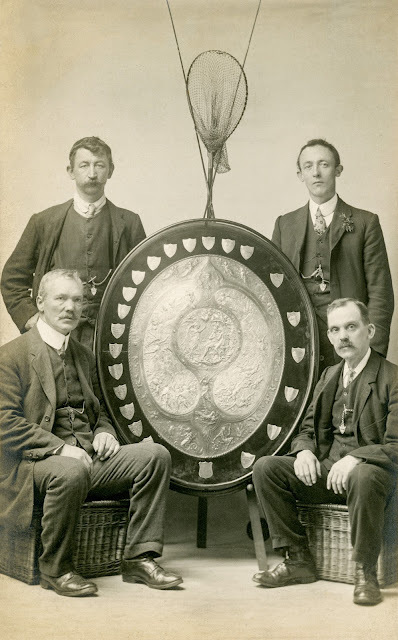 My catch is this splendid photograph of a group of Edwardian fishermen who look as if they have been taking part is some very prestigious fishing competition. Even with the most powerful magnification I can't quite make out either the name of the trophy or any of the winners (although one of them might just be West Leeds Angling Club). Hopefully, the trophy still exists, hanging from the wall go some half-forgotten club house. 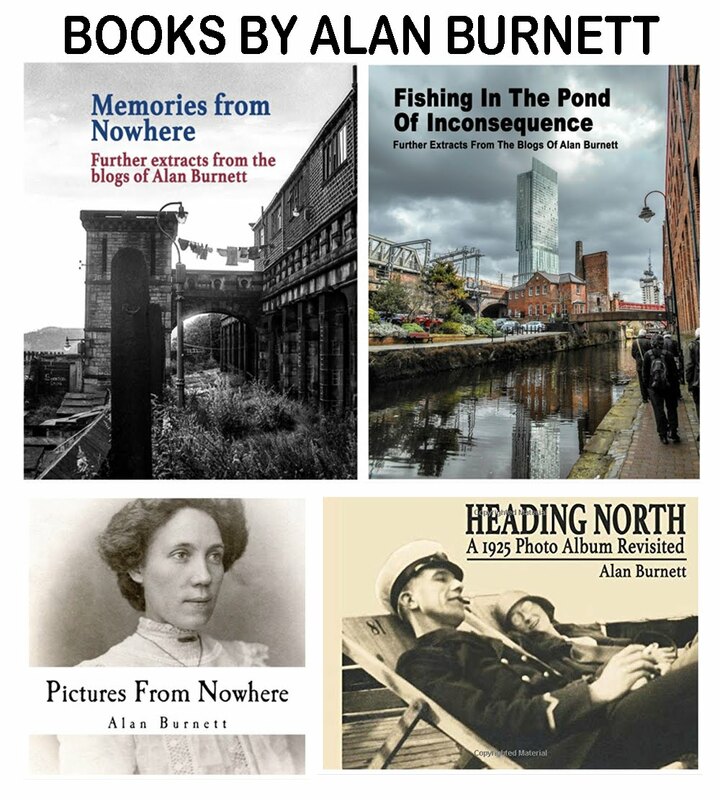 Sadly, the Anglers themselves will be long-gone. 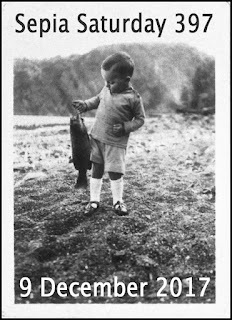 To see what other Sepians have caught this week, go to the Sepia Saturday Blog and follow the links. Today's dip into the pond of inconsequence rewards us with the sound of live music - or at least the look of live music. 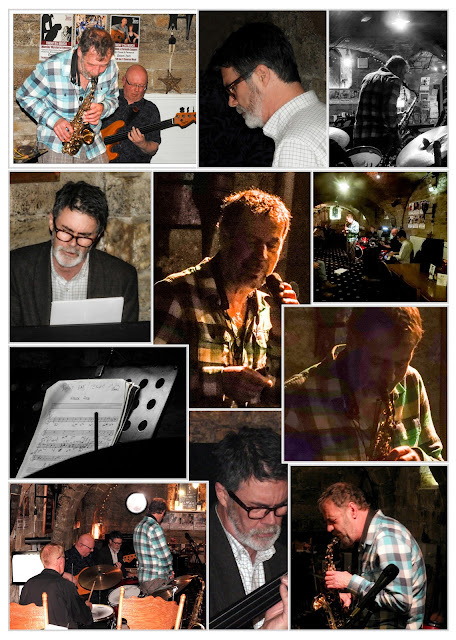 Dave Newton, Piano; Jon Taylor, Saxophone; Dave Rocky Tyas, Drums; Ben Crosland, Bass. December is a busy month: cards to write, presents to buy, quantities of alcohol to consume - and with all this going on there is little room for logical blogging. Luckily, I am committed to illogical blogging which is devoid of meaning and therefore I can carry on in my own sweet way, dipping into the pond of inconsequence with the gloved fist of uncertainty. Today it brings to the surface the Empire Medway. 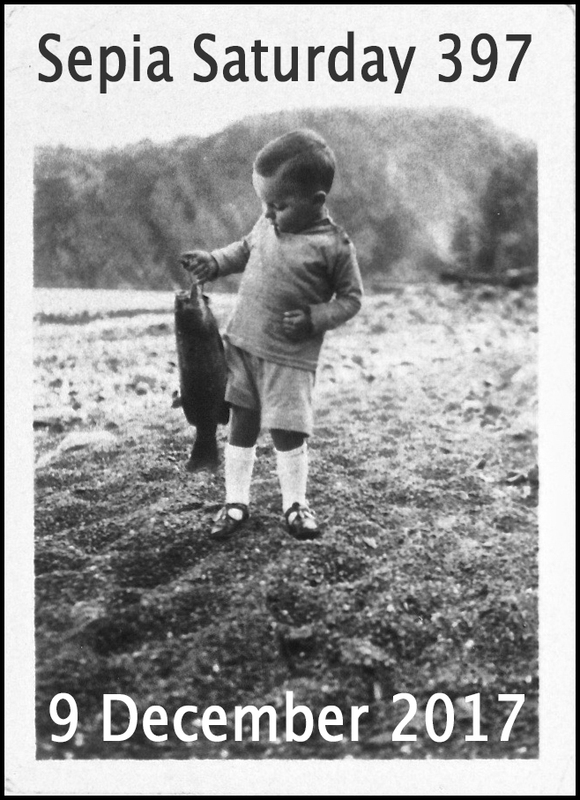 This is a scan of an old print of unknown provenance that came into my possession in ways I have long forgotten. 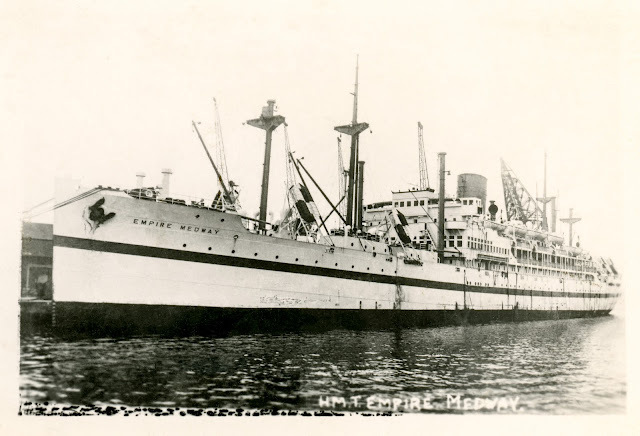 It shows the ship, the Empire Medway, which, at the time, had the designation "HMT" or His Majesty's Troopship. It was built in 1929 and for the first 21 years it went under the name of the Eastern Prince, before being renamed in 1950. During the war it served as a troopship and its finest hour was probably in February 1945 when it served as the accommodation and support vessel for Winston Churchill's staff at the Yalta Conference. After the war it continued to ferry troops around the hot spots of the world until 1951 when in was involved in a collision in Valletta Harbour in Malta. Two years later it was scrapped, leaving behind a handful of memories and the odd old photograph. This is one of those little family photographs handed down within my family. 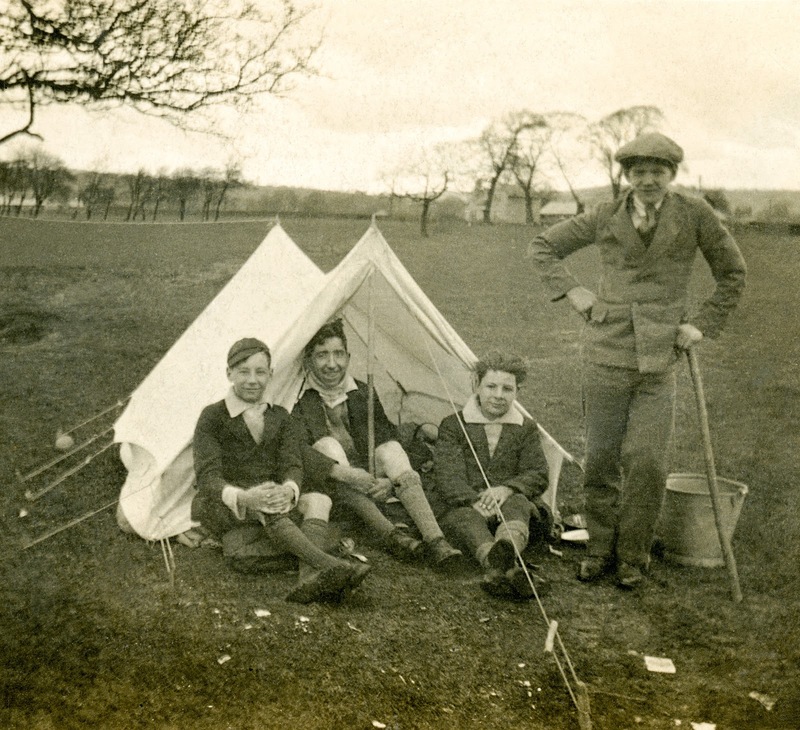 Luckily, it is one of those rare photographs which has been annotated on the reverse, so I am able to identify the participants in this camping trip. They are, from the left, Billy Duffie; Monkey Matthews; Bunny Smith; and, my father, Albert Burnett. Just where they were camping is not stated, but it will have been somewhere not far from Bradford where they all lived. The date, I would guess, was about 1925. Ah, the good old days, when family entertainment meant more than playing Angry Birds on your iPad. 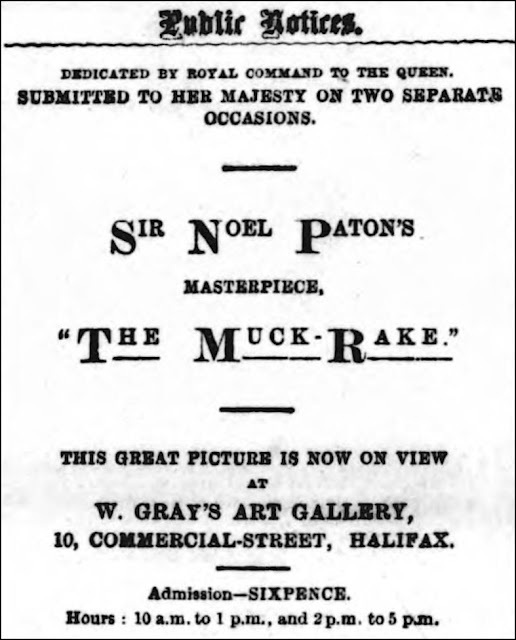 According to the Halifax Courier of 2nd December 1899, if you had nothing better to do on your afternoon off, you could take yourself along to Gray's Art Gallery on Commercial Street and pay sixpence to have a look at Sir Noel Paton's latest masterpiece - "The Muck Rake". Was it value for money? To answer the question you don't need to pay sixpence (which would have been about £10 in current prices), all you need to do is to stop playing Angry Birds for a minute and Google the painting. I have to say, I think the citizens of Halifax in 1899 were being diddled!